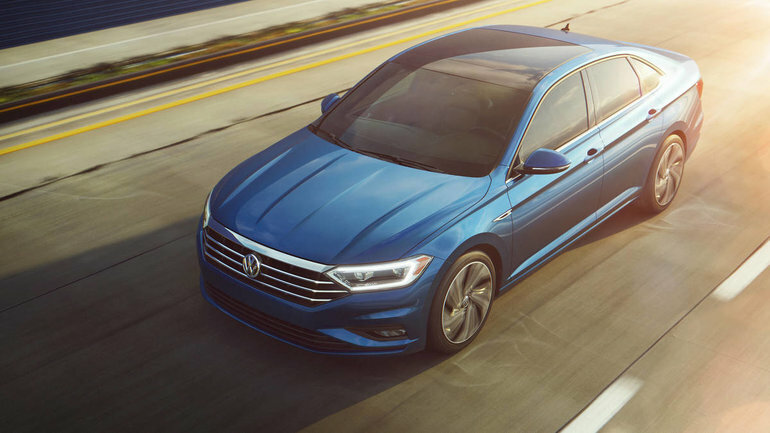 The 2019 Volkswagen Jetta arrives with three trim levels to suit different shoppers. Comfortline editions offer a surprising list of standard features. Highline models add amenities as well as crash avoidance systems. Execline models add an upscale style. All editions reflect a greater emphasis on contemporary technology. A new look brings a modern feel to the well-known Jetta. Longer and taller than its previous model, the sedan looks more like the Passat. The new architecture includes a more aerodynamic, fluid exterior. The ends are complemented by dramatic fender creases. Heated windshield washer nozzles are standard, and the Comfortline adds Rain-sense wipers. Not only is the new Jetta’s exterior stunning in terms of looks and style, it also features many high-end and very functional features. Standard on all editions, LED lights now add their glow to the front and rear of the car. LEDs are used for the headlights, daytime running lights, and taillights. Automatic headlights have a leaving home and coming home function. An available Light Assist will regulate your high beams for you. Letting light into the cabin, the sedan has an available rail-to-rail sunroof. Your family can drink in the sun's rays or enjoy a look at the stars and moon. The efficient 1.4-litre turbo develops 150 horsepower and 184 lb.-ft. of torque. It comes standard with a 6-Speed manual transmission that will please automotive enthusiasts. For those who prefer to take the road with ease, the eight-speed automatic transmission is a revelation, it takes precision to a new level. Driving modes include Eco, Comfort, Normal, Sport and Individual. The automatic Jettas have stop-start technology to reduce the car's fuel use in areas where red lights are frequent. Inside, the basic trim is anything but basic. It has a 6.5-inch touchscreen with VW App-Connect. This system is made complete with Apple CarPlay, MirrorLink, and Android Auto. Leatherette trims the seats in the Comfortline edition which also comes with the Climatronic system. A larger touchscreen adds a fingertip proximity sensor for faster responses. An eight-speaker Beats Audio and the Volkswagen Digital Cockpit are new to the Execline model. You'll enjoy a more upscale atmosphere with details such as 10-colour configurable footwell lighting. Drivers will want to invest in crash avoidance features such as the emergency autobrake and the lane assist.